I was raised in a Christian home and was in church from the time I was four. I grew up in a small Southern Baptist Church in the DFW area and, although I know that everyone has a different experience of church – no matter the denomination, my experience in church was overall a very positive and affirming one. I was loved, cared for, taught and encouraged. I was also admonished when I needed to be, but with love and kindness. When I think back on my experience in church growing up, I feel very blessed. The people of my church were my family. They taught me things. They helped me become who I am. Without them I cannot imagine where I’d be. Richard taught me how to love people no matter what they looked like by loving me just as I was and no matter how I dressed. Nita and Ginger taught me about missionaries and what it looks like to serve God in other places. Johnny taught me about worship and later he and his wife, Leona, taught me about marriage and parenthood. Miss Rose taught me about Jesus. Miss Bessie taught me about faithfulness. My friend, Chris, taught me about loyalty and about unconditional love. Paul taught me about evangelism and his wife, Christy, taught me about modesty. Pattie, though she may not know this, inspired my dream of becoming a worship leader. Later in my life and ministry Eric and Paul Michael taught me about what ministry really looks like and they both encouraged me and believed in me enough to help me find my own. Dennis taught me about myself, who God made me to be, and that I didn’t need to be afraid of it. After over ten years of ministry in churches, I’m still learning from the people who I serve with. Lee is teaching me about grace – not only through his words, but mostly by his example. Rachel is forever teaching me about forgiveness and courage. Amy is teaching me about joy and friendship. I cannot count the number of people who have spoken love and life to me over the years. These people are all church people. These people are all my people. We speak the same language. We think the same thoughts. We have the same burning passion for Jesus and for people to know Jesus. Church is meaningful to me. Church people are meaningful to me. I never understood the enormous difference between my experience with church and the experiences of the people around me that seemed to be so negative. That was, until I had some negative experiences of my own. It’s amazing how completely oblivious we are to the world around us until we get a taste of it ourselves. I have been deeply hurt by church people, too. I carry deep scars that may never fully heal from people who follow after Jesus. And I’ve left scars of my own too. And I think that’s the part that hurts the very most. Church is supposed to be a place where broken, hurting people can come to be healed and loved by Jesus and supported and encouraged by each other. And sometimes we’re great at that. But sometimes we’re not. Sometimes I think we’ve missed the point entirely. Christians spend so much time trying to stand out from the world as “holy” or “set apart” and that’s exactly what we should be. But I often wonder if we’re trying harder to ACT holy than we are trying to BE holy. Love comes first. 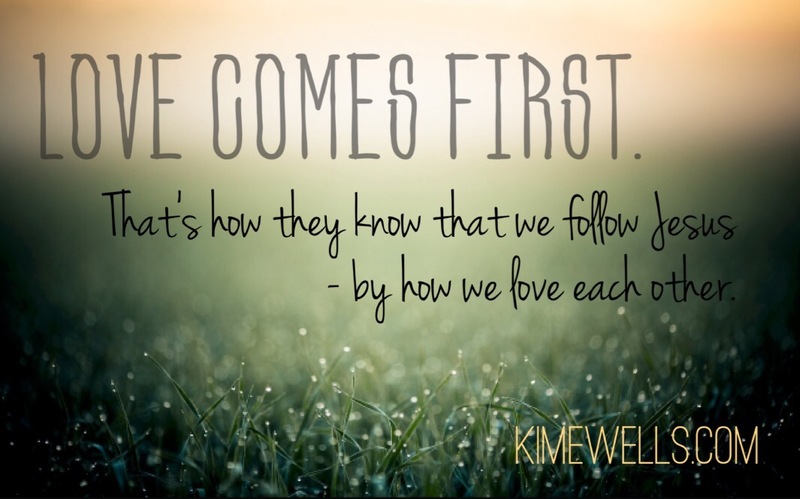 That’s how they know that we follow Jesus – by how we love each other. Christian to Christian. Christ follower to Christ follower. Believer to Believer. How we love each other matters to the people around us. When they see us bickering over stupid things, arguing over theology, fighting over semantics it makes it look as though we hate each other. The world is having a hard time believing that following Jesus is worth anything because even His followers can’t get along. Forget about how we treat the rest of the world – although that’s enormous too – we can’t even get along with each other! Think about that. We’re part of a family that has something incredible to offer. We desperately want the world to know what we have to give. What we have to give is good and real and life-giving and FREE! So we stand up and start telling everyone how wrong and stupid and awful all our family members are. Then we tell all of those people how horrible and unlovable they are too. And we cannot figure out for the life of us why they aren’t interested in our offer. It’s ludicrous. It really is. The world needs Jesus. Desperately. He is the source of love, peace, mercy, grace, forgiveness, healing and everlasting life with a perfect, holy and loving God. But the world won’t ever see Him in bickering Christians, or prideful pastors. When we spend all our effort and energy on “defending the Gospel” instead of living the Gospel we’ve entirely missed the point. I don’t believe that the Gospel needs defending anyway. What if instead of boldly proclaiming the truth (as we understand it) we were graciously living the love of Christ? Instead of boldly proclaiming … graciously living. Wouldn’t that make the world stop and take a look? I believe that the way that we treat each other as Christians greatly affects the way people around us view Christianity. I know that it is such hard work to find common ground with people you vehemently disagree with, but if we are to be Christ’s love to a hurting world we have to try. We have the ultimate common ground: grace. I couldn’t agree more. If the world is ever going to care what we have to say, they need to know how much we care about them – and how much we care for each other. PS: If you’re at all interested in helping to bridge the divide between gays and the church, please go buy and read Justin’s book. It affected me deeply. You can also find his blog here. I read a book last year that took hold of me and started me on a journey to a different kind of thinking. I cannot tell you how profoundly this book impacted my heart. The book is Tattoos on the Heart by Gregory Boyle. Father Boyle is a Jesuit priest and the founder of Homeboy Industries in California. His book is about grace, redemption, love and life. I urge you to go read it. I was flipping back through it this morning, reading all of the things I highlighted and underlined. As I was reading through his chapter called Gladness, I felt compelled to share a bit with you. I must have read that last sentence a dozen or more times. Even now as I read it, I feel so affected by the truth of the statement that it brings tears to my eyes. We breath in the delight of God and it works on us. Then we breath out that same delight to the people around us. This is God’s purpose for us. To breathe in His delight – His pleasure in us – His love for us. We breathe in His love and we breathe out His love. Inhale and exhale. Delight in, Delight out. Acceptance in, Acceptance out. Grace in, Grace out. Peace in, Peace out. Love in, love out. That is our greatest purpose. I truly believe it is that simple. We are to be instruments of His love, His peace, His grace, His mercy, His delight. God’s love for us, His delight in us fills up our lungs and our hearts and our minds and we breathe it back out into the world. We make loving people and loving ourselves so complicated. We have all these prerequisites for worthiness. When really there are none. It’s not complicated. It may not be easy, but it’s not complicated. Breathe love in. Let it work on us. Breathe love out. My prayer for you this week is that you breathe in the incredible love of the Father who delights in your very existence. That you let that delight work on your heart until you understand how very enough you are – how very loved you are. That you exhale that same love, grace and compassion to the people around you.